I was never into making invitations or party favor with scrapbooking supplies, but for a while I have come to like it! 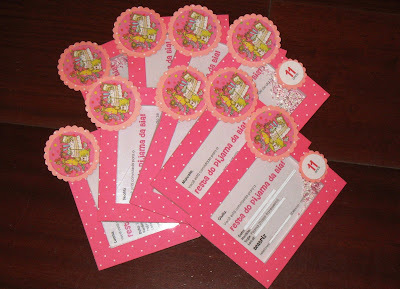 look how cute my daughter's birthday party invitations turned out! She loved it! It's a simple invitation, but it is a shaker box, and who doesn't LOVE a shaker box? LOL Even those who don't admit they love, like to shake it to hear it! E olha que fofo esse desenho! Vai ser uma festa do pijama, e esse é o desenho dos pratinhos que eu comprei. Isn't this little picture adorable? It is going to be a slumber party, and I scanned it is from the plates I bought for the party. E festa do pijama é muito legal. 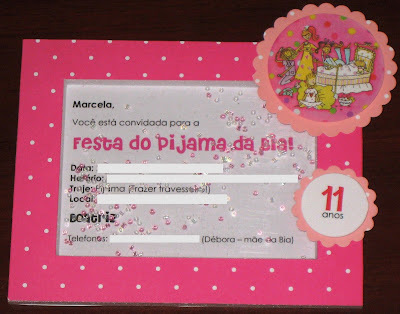 Lindão Déa , adorei a idéia, e festa de pijama é tudo de bom!!! Que coisa mais fofa, Dé... adorei! E eu amooo festa do pijama! rs... Beijocas!